Chateau Kefraya Wine of Lebanon – Kefraya, Bekaa. the tour starts at kiosk Bellini. This information and reservation desk will guide you through a large range of oenotouristic activities. 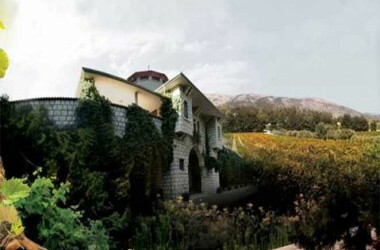 Throughout the unique journey, the trains will take you to discover the vineyard or explore the exceptional Romano-Byzantine site of Daher El Mogher, you will be introduced to Chateau Kefraya‘s distinguished history by viewing a video and visiting the museum, and you will also have the chance to learn more about winemaking through a guided tour at the winery while discovering the premises’ tremendous recent evolution. The showroom L’Accueil Dionysos offers free tasting of the whole range of wines.